Star-Ledger Editorial Page: Still Incoherent On "Choice"
Horizon Blue Cross Blue Shield of New Jersey, the state's largest insurer, has rolled out a new insurance product — the OMNIA Health Alliance — that threatens to erode the bedrock of New Jersey's health care marketplace at the eventual peril, we believe, of dozens of hospitals and tens of thousands of health care consumers in New Jersey, especially the uninsured and the under-insured. We urge you to examine OMNIA more closely and take swift and strong executive action. The state of New Jersey has always provided oversight of its insurance industries to protect consumers, and there is no more important and universal consumer in this state than the one who seeks health care, because everyone at every stage of life is entitled to quality health care from the provider of their choice. Horizon's plan gives its insured members a monetary incentive to seek care at hospitals it considers more qualified than others based on non-transparent criteria it alone has selected and did not vet in any public forum. Regrettably, patient preference was never considered by Horizon. Nor did its "quality" ratings of hospitals square with the reality that many, if not most, hospitals to which it failed to grant favored status within its network are widely acknowledged as among the best in the state for clinical care. Rather, in one fell swoop, New Jersey hospitals have been divided into "haves" and "have-nots." The "haves" are the state's largest health care systems and a small handful of independent hospitals chosen to fill in voids where those systems do not operate. The "have-nots" are the segregated hospitals, many of which rely on the reimbursement of private insurers like Horizon to offset the costs to treat our neediest patients, the indigent who rely on charity care or Medicaid. Everyone get this? Horizon is advantaging hospitals that serve less needy patients, and that's restricting "choice." And it's doing so using a system of rating hospitals that is not transparent. New Jersey's dominant health insurance company, Horizon, is facing growing opposition to its Omnia plan — and for good reason. The plan presents a threat to some of the state's best hospitals, especially those serving more than their share of poor patients. Catholic hospitals are at special risk. Horizon is doing all this behind closed doors. Worse, there is good reason to believe that the company is picking winners and losers based on its self-interest, rather than the public good it is expected to protect as a non-profit. Here's the problem: It is closing this network to many of the state's best hospitals. It is scoring them in secret, and refusing to release those findings. The losing hospitals are placed in Tier 2, where patients will not receive the same discounts. It's not hard to see how this will play out: Patients will flock to Tier 1 hospitals, drain huge streams of revenue from Tier 2 hospitals. Some of them will likely close, and most will be forced to scale back on charitable services, according to several hospital executives and legislators. The SLEB is shocked -- shocked, I say! -- that Horizon would create incentives to drive customers to favored hospitals that do not have a record of performing any better than others that will likely close when they are denied funding. The SLEB finds it "reckless"* that the system by which Horizon determines a hospital's efficiency is not subject to transparency. They find it completely unfair that hospitals that serve the most disadvantaged patients will suffer because funds will be diverted to preferred hospitals -- again, which have not been shown to do a better job treating patients. Why, then, don't Tom Moran and the charter-loving Star-Ledger Editorial Board find it "reckless" to promote a system of urban schooling that drives students toward charter schools, which are "held harmless" in funding but have never been shown to perform better on average and are judged by evaluation systems that are not transparent and contradicted by the state's own data? The SLEB is terribly concerned that hospitals which serve the neediest patients are going to be closed. 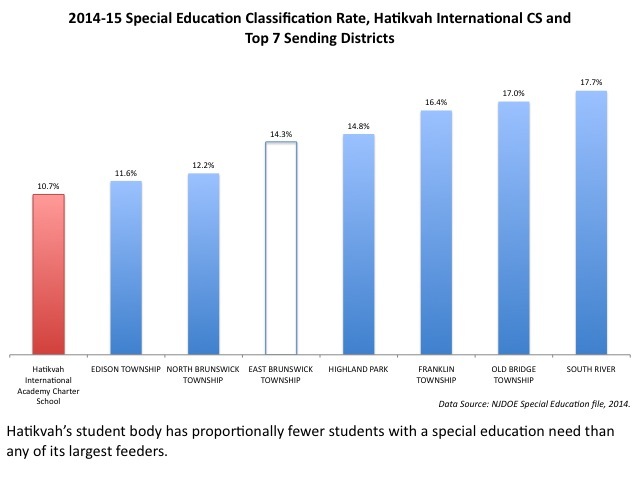 Why don't they care, then, that New Jersey's charters are not enrolling equivalent populations of special education, Limited English Proficient, and free lunch-eligible students? In Newark, public district schools were closed, "renewed," or covered to charters, all while the charters continued to expand. 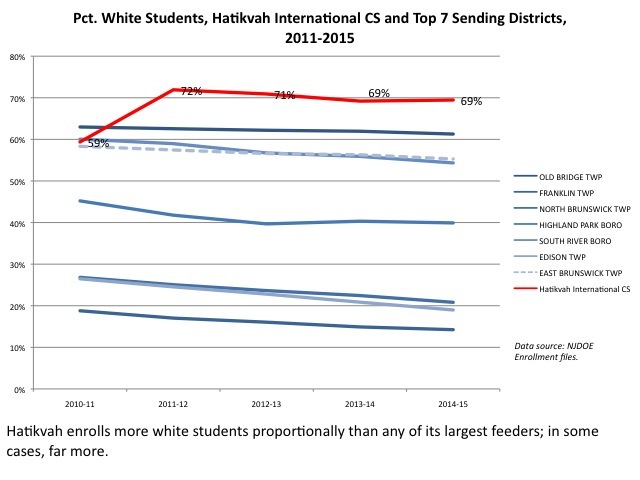 But those district schools were enrolling more economically disadvantaged students. Why doesn't the SLEB care about this if they care so much about the same thing happening in hospitals? The charter schools in Newark and elsewhere have been "held harmless" from funding cuts that have devastated public district schools -- again, even as they enroll less needy students. This year, Christie is going to pitch in more in state aid to those districts, but that aid will flow straight to the charters: public district schools will continue to be grossly underfunded. Where is the SLEB's concern over this if they care so much about unequal incentives for hospitals? The NJDOE rates schools in a way that punishes schools that serve students with greater needs. Newark (and Camden -- more soon) rated its schools as part of its One Newark plan, but the ratings were clearly biased against schools that enroll more black, special needs, and free lunch-eligible students. Why doesn't the SLEB care about this if they care about hospitals getting biased ratings because of who they treat? The answer is obvious: Tom Moran and his Editorial Board have made up their minds thanks to a constant stream of propaganda foisted on them by the New Jersey charter industry. 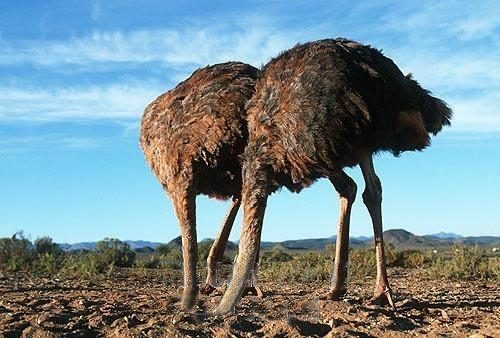 They are so enthralled by the easily digestible talking points fed to them that they can't even see the screaming contradictions between their stance on charters and their stance on Omnia. Once again: I am not against charter schools per se. There is a way to offer "choice" that does not create problems for public district schools. But when chartering is done improperly -- as it is in New Jersey and so many other places -- it fosters segregated schools with redundant systems of governance that promote bad behaviors. If the Star-Ledger's Editorial Board could get its head out of the sand, it might come to understand this. "Charter school problems? What are those?" Data abuse in eduction policy has got to stop. I freely admit that there can be different, equally valid ways of interpreting data. I am the last person to say a data analysis is always "proof" of a particular point someone wants to make. I am leery of the use of overly complicated statistical methods when simpler descriptive methods may be better. But there is no excuse when a school "leader" misuses data to justify his or her practices and policies -- particularly when they do so at the expense of others. I'm cynical enough to know politicians and media pundits can and will do this all the time; however, when someone in a position of authority at a school or a district or a state agency or even the USDOE abuses data to make themselves look better and others look worse, it's completely unacceptable. We are told over and over again by those in positions of influence that we have entered an era of "data-driven instruction." Well, if that's true, a leader is just as derelict in his duty when he misuses data as he is when he misapplies educational practices within the bounds of his authority. This particularly irks me because we are seeing more "alternative" programs like Relay Graduate School of Education or the Broad Superintendent's Academy or SUPES that appear, to me, to have little interest in developing future educational leaders as good consumers of research and data. I'm not saying university-based programs don't often have flaws when it comes to training their students how to use data. I'm not saying that good training is a guarantee of future best practices. But you can't expect America's students to engage in "rigorous" thinking when the leaders of their schools and their districts and their educational agencies brazenly misuse data. We have an obligation to model the sort of thinking we expect from our students; too often, we don't. 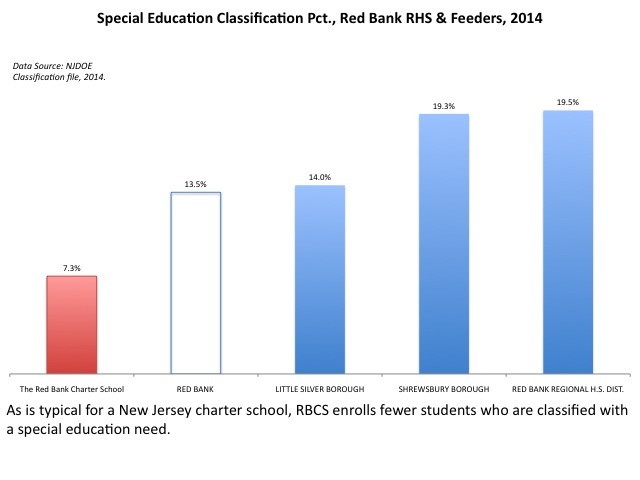 I've already written about the Red Bank Charter School in New Jersey. 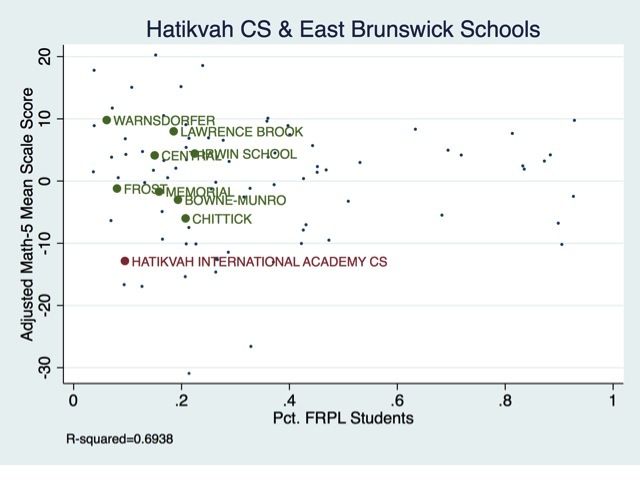 RBCS is a segregated school compared to its host district, which is a shame because the area, in my opinion, is ripe for a type of school consolidation which could lead to a truly integrated school district. 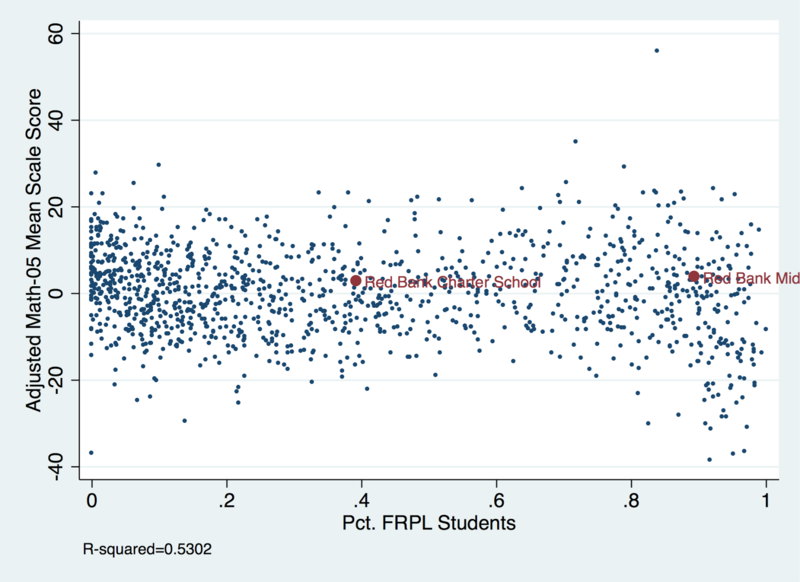 You can't compare school outcomes without controlling for student population differences. Even the NJDOE, which has engaged in some seriously awful data abuse over the years (things do seem to have improved somewhat lately), knows it makes no sense to compare a school with very few children in poverty to a school with many children in poverty. 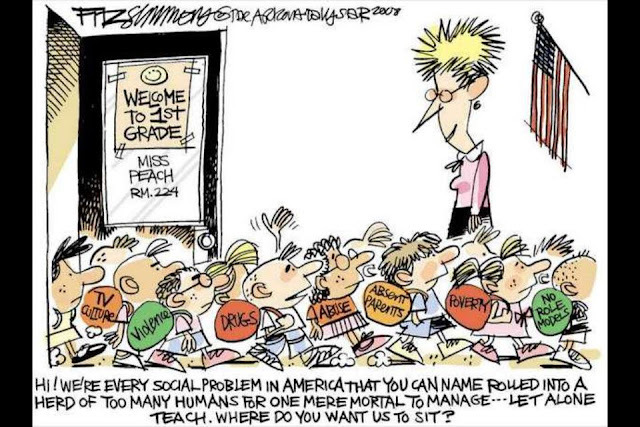 That's why they have peer groups (faulty as they are) for their school performance reports. That's why they developed SGPs (even if those don't fully control for those student differences). Again, I don't know what the NJDOE told Pennotti, but she, as a school leader, should understand that simply comparing test-based outcomes without acknowledging student differences is just not warranted. 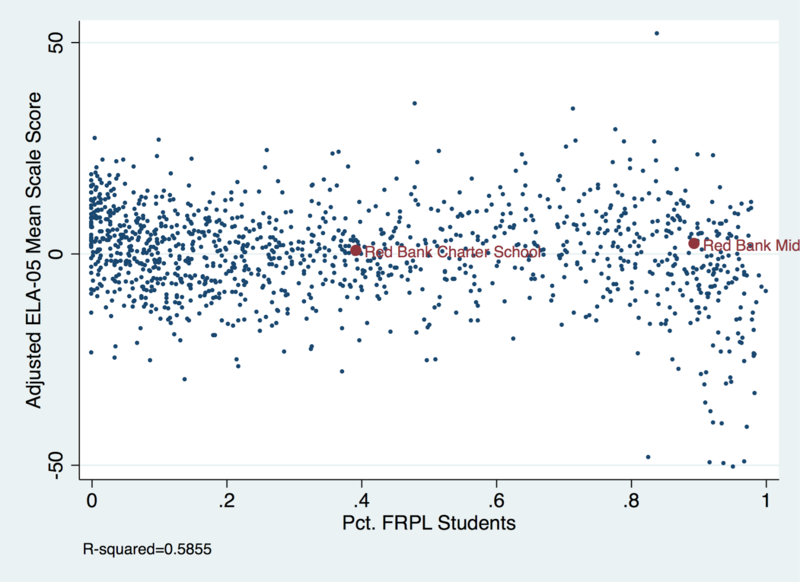 In fact, she herself acknowledges this in her quote: she admits it's not fair to compare RBCS with RBBPS without "taking into account" student differences. I'm sorry if this is coming across like I'm picking on a mom-and-pop charter school. As I said before: I have no doubt that RBCS is full of dedicated teachers and staff, working hard on behalf of their deserving children. 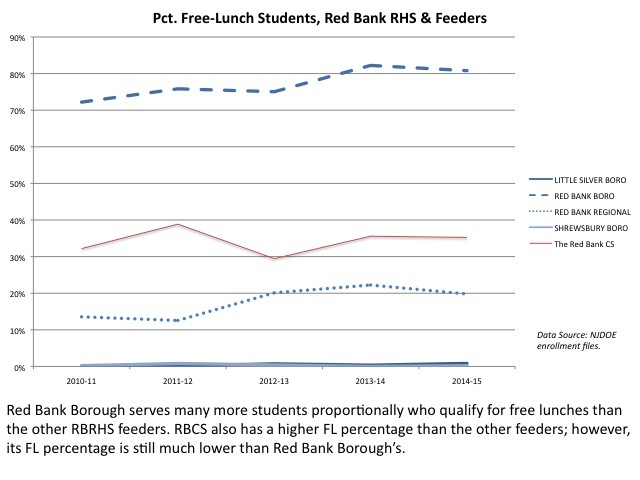 In the absence of proof to the contrary, I happily accept that RBCS is doing terrific things for its students. But when a charter that serves a fundamentally different student population compared to its host district then beats up on that host for having lower test scores, that's just unacceptable. 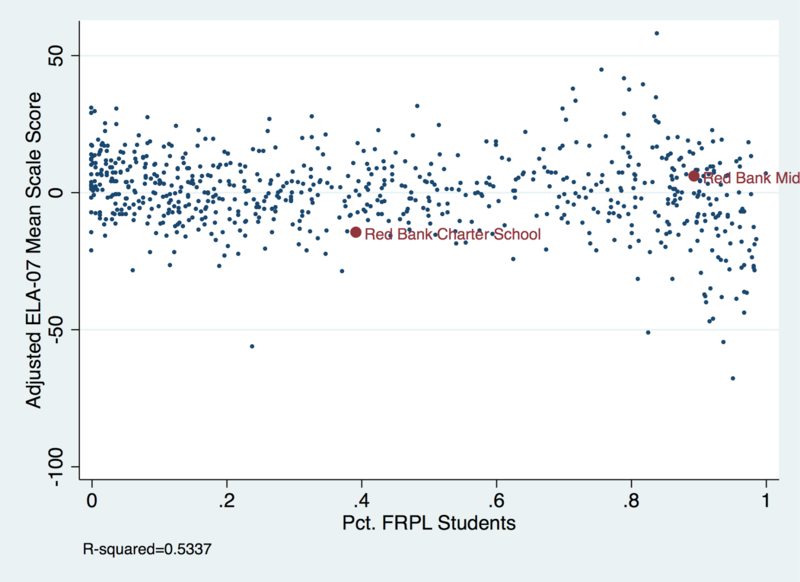 When I compared the test-based outcomes of RBCS to RBBPS in my last post, I used a simple regression model to adjust for student characteristics. We can argue about the validity of the model, and that's fine; I'd never claim that one school was "better" than another based on test scores anyway, even if they are adjusted. 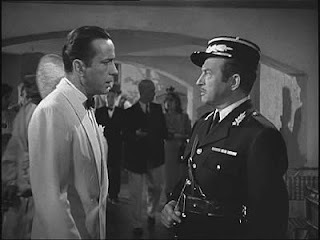 What I will contend, however, is that if you don't even try to adjust for student differences, you're not playing fair. Again: this is the most generous comparison out of the 11 that I've run. 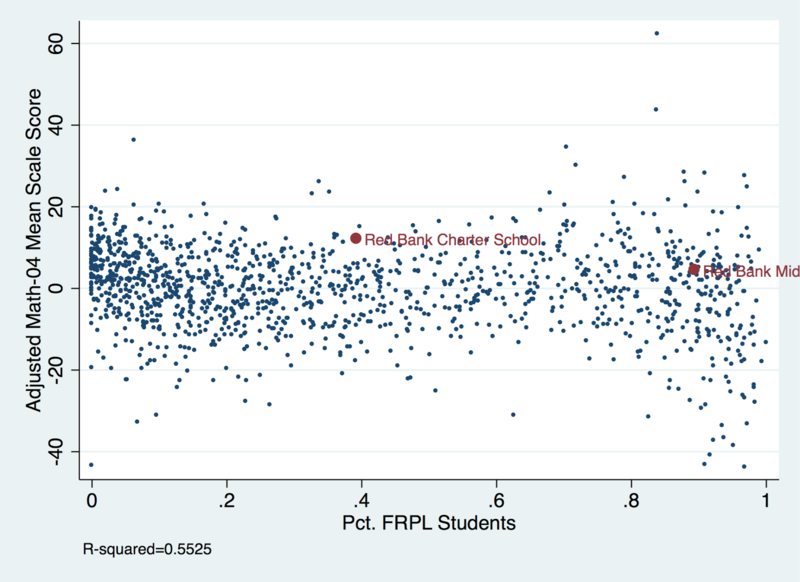 Does it look like RBCS is substantially outperforming RBBPS to you? 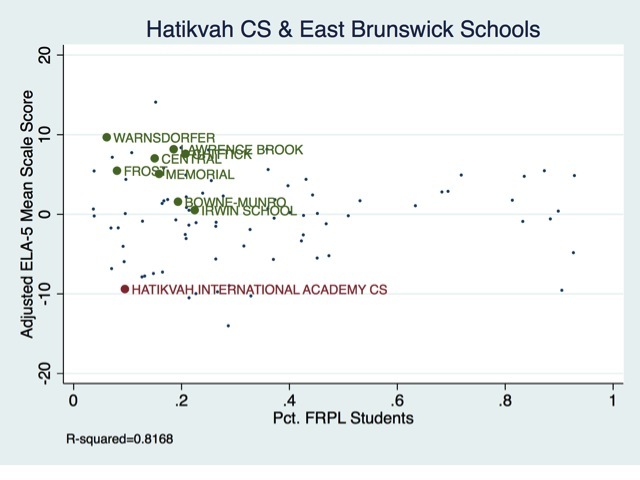 Again: this in no way "proves" that RBBPS does a "better" job with its Grade 8 students than RBCS. 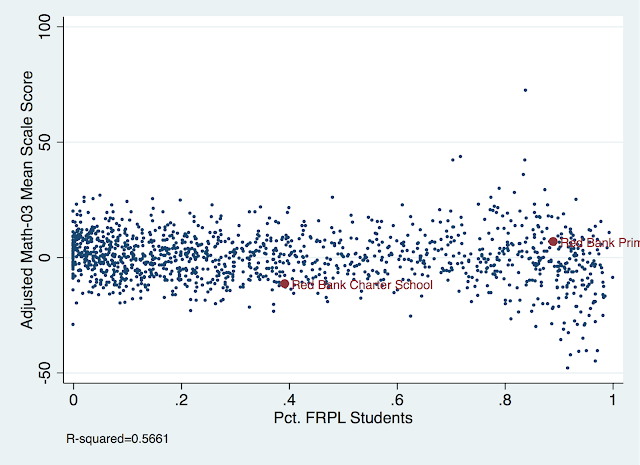 What it does show, however, is that when controlling for student differences, there is no evidence RBCS "outperforms" its host district. I don't expect RBCS to run this sort of analysis (although I do expect it from NJDOE when they make a decision about the expansion -- that's their job). I don't expect RBCS not to tout its successes. I don't expect any charter not to be proud of what it does. It's perfectly fine to be proud of your test scores and proficiency rates -- within proper context. But when you use these test scores to pump yourself up at the expense of schools that are educating a fundamentally different population than your school, I lose all patience. It's an abuse of data and, frankly, an abuse of authority. It shows a lack of rigor and a disregard for the hard work of your colleagues in the public district schools. It's self-promotion at the expense of people who are doing a job you don't do. *ADDING: Here are the other regressions. The model uses PARCC mean scale scores as the dependent variable with two predictors: the school's percentage of free and reduced-price lunch students, and a three-year average of its special education percentage (I used that because I don't have 2014-15 special education data). I didn't include Algebra 1 or Grade 8 math scores because students could take either, depending on where they are placed, in 8th Grade. 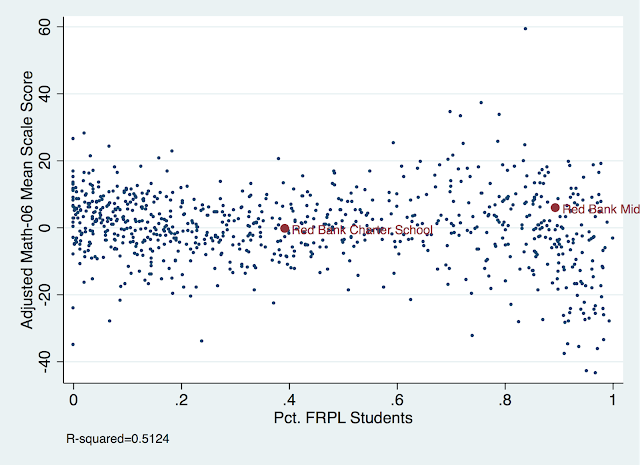 The number of RBCS Algebra 1 test takers is so small it was suppressed in the data. 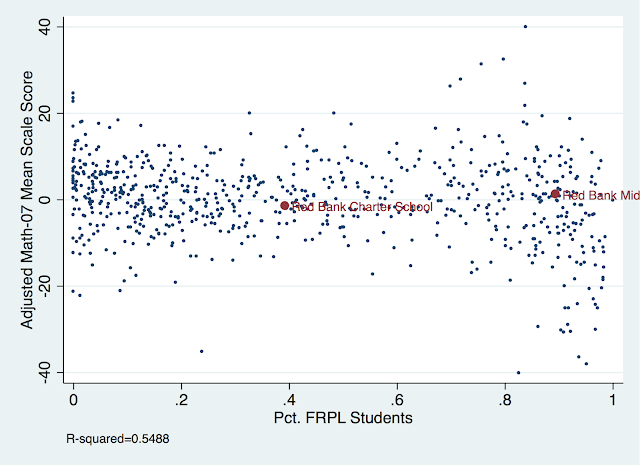 I plot the adjusted score against FRPL percentage to give the chart a little more context. 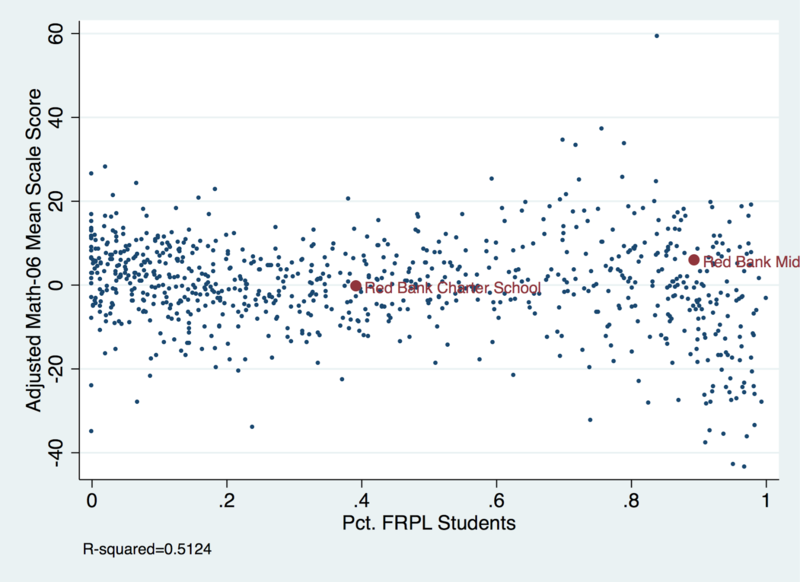 I did run a model with the percentage of Limited English Proficient students at the school, but it was not a consistently significant predictor, so I left it out; that would likely change if we adjusted the sampling frame or the test outcome. Again: the point here isn't to "prove" one school is better than another. 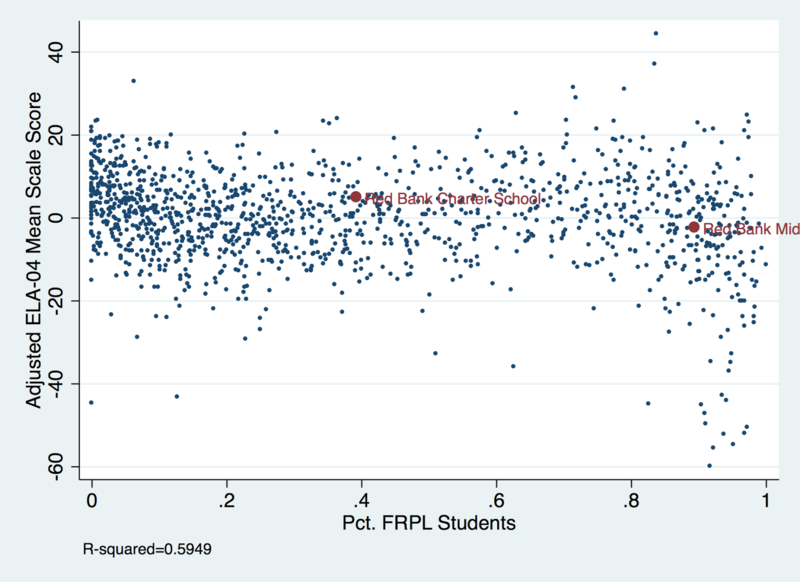 The real question is: does RBCS consistently "outperform" RBBPS when "taking into account" differences in student populations? Clearly, the answer is: "no." I'm guessing that New Jersey's pension "reformers" are thinking the same thing: now that Chris Christie's absurd run for the White House is over, they should make their push to screw public employees out of their pensions now, rather than later when we are nearly certain to have a Democratic governor. Benefit levels are far higher for New Jersey public employees than is common in the private sector. It is the Obama administration, not Republicans, that has said health benefits at the New Jersey level should be subject to a luxury tax. So there are two paths. Ask taxpayers to continue subsidizing a level of health benefits that even the Obama administration says is too rich. Put those benefits at or near the highest level specified under Obamacare, and use those savings to fill the hole in the pension funds. Certain Democrats say "just make the payments." But when the governor asked a joint session of the legislature for a show of hands on who was willing to vote for higher taxes in order to do so, not a hand went up. It is fair enough to say that neither the governor nor legislative leaders should have signed a 2011 deal that was premised on unrealistic revenue projections. Let's not compound that mistake this time with a constitutional straitjacket and more unrealistic revenue assumptions. Delay may allow politicians to posture and build alliances. But until they deal with the facts as they are, rather than as we wish they were, it is a grave disservice to public employees who have played by the rules and deserve a secure pension. The commission's plan essentially comes down to this: make public employees pay more for their health benefits, and then take that money and put it into the pensions. Then the state should get out of the pension business and let the local districts offer retirement benefits. In other words: the public workers, who have been the only ones who have made any sacrifice to shore up the pension system, should be the ones to bear all the cost of "fixing" it. I've been teaching in New Jersey for 11 years, and during that time, I have seen both my mandatory payments into the pension and my premium payments for health insurance skyrocket. We public workers were told repeatedly that the Pen-Ben reforms of 2011, which lead to those increases, would "save" our pensions. At the same time, under Christie, taxes have gone down for millionaires while there have been billions of dollars of corporate tax giveaways. New Jersey’s pension system spent $701.4 million during the last fiscal year on fees, expenses and performances bonuses for alternative investments, including on its money-losing hedge funds, according to the head of the state’s largest labor union. AFL-CIO president Charles Wowkanech said that figure will be included in the pension fund’s annual report, which may not be released for several seeks. He said the fund spent $375 million on management fees and expenses for the alternative funds, as well as $328.4 million on performance bonuses for those managers. Combined, the costs represent a 14 percent increase from the 2014 fiscal year, when the pension fund spent $615.9 million on alteratives management. Keep in mind that Tom Byrne is a Wall Street type who oversees the investment of the pension. Apparently, when it's my money, Byrne is happy to reward folks whatever he thinks they deserve. He actually compares the outrageously high fees these investment managers get to paying Derek Jeter a large salary because he was good shortstop. What funny about this is that Byrne believes that market incentives work for hedge fund managers and baseball players, but not for public employees. In his world, cutting the compensation of investment managers will get you less talented people -- but cutting the compensation of teachers will somehow have no effect on who chooses to enter the profession. 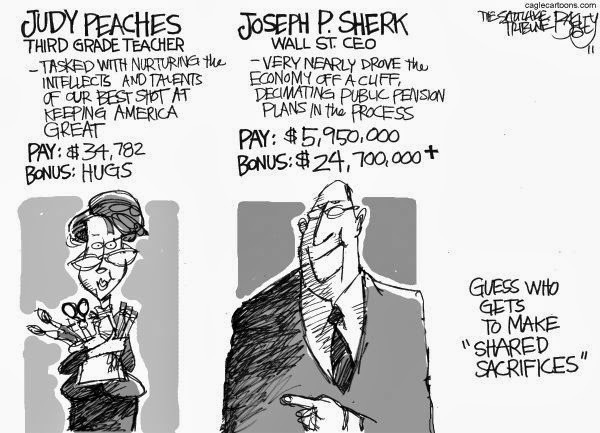 As I've shown many, many times, teachers most certainly do suffer a wage penalty for teaching. Public employees in New Jersey are not overpaid, and their pension benefits are comparatively modest. But Byrne's commission doesn't want you to know that: all they care to show is that public employee health benefits are generally better than those in the private sector. They don't want to consider that the total compensation package is the correct comparison, and that pensions and benefits are part of the incentive to bring qualified workers into public service. You can't keep cutting wages and benefits for teachers and other public employees and expect the same quality of workers to enter public service. This idea so obvious that even Byrne knows it -- he just refuses to apply it to public workers, saving incentives instead for the Yankees and Wall Street. All this said: do I think we can tax our way out of this? Almost certainly not. But you can't continue to ask public employees to bear the sole responsibility for getting the pension back on to a stable footing, and you can't expect public employees to simply keep shelling out more money for health care costs without doing something to bring those costs down. - The millionaire's tax need to be reinstated -- any proposal that doesn't include it is a non-starter. Yes, I know it isn't nearly enough to fix this mess, but all the givebacks public employees have made haven't been enough either. We took the first step; it's time for the wealthiest people in the state to start doing the same. And I don't want to hear any more about out-state migration. What makes anyone think that's going to happen, but people leaving public service when their compensation is cut isn't likely? You can't have it both ways, folks. - The pension management fees must be contained. It's simply outrageous to ask a teacher to continue to sacrifice while hedge fund managers take billions out of the system. If the people who run the pension can't negotiate tough deals with Wall Street, they should be replaced by people who can. - It's well past time to negotiate hard with the for-profit hospitals, the drug companies, and the private health insurers. Benefit "reform" shouldn't just mean "public employees pay more"; it should include workers getting more bang for their health care buck. Say what you will about Bernie Sanders, at least he's been able to get the idea that America way overpays for health care into the conversation. We should be heeding that notion locally. The state has a great big pool of workers; it should be able to negotiate hard with heath care providers. They can still make lots of money -- just not as much as they've been making. If that's unacceptable, too bad. 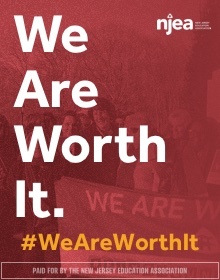 If, and only if, public employees start seeing some real shared sacrifice from the wealthy interests that have done very well for themselves over the past decade, we can then have a further conversation about paying more for health care and stabilizing the pensions. But that day, so far as I'm concerned, is not yet here. Over and over again, New Jersey's public workers have made concessions to fix the pension mess. Don't ask us to make any more unless and until the wealthiest among us make some sacrifices as well. Looks like Eva Moskowitz has yet another p.r. disaster to contend with, courtesy of the New York Times: a one-minute video of a Success Academy teacher ripping into her first grade student because... well, honestly, I can't tell. Clearly, the girl in the video gets something wrong on her math problem -- but it's also clear this burst of anger from the teacher was a long time coming. Of course, what Charlotte Dial does in this video is really horrible teaching; even she admits that. If Success Academy knew that she had behaved this way even once, they should have intervened and let her know in no uncertain terms how unacceptable what she did was. And if she did it again, she should have been removed from the classroom. The fact that Dial is white and the student is black makes this especially troubling. I'm all for teachers being authoritative, but too many students of color are living a school experience where they are dehumanized by teachers of a different race. To be clear: I don't think this is confined just to "no excuses" charter schools; we've seen far too many examples of bad behavior against students of color in public district schools to pretend that it's only the charters that are guilty of perpetuating a hidden curriculum. That said, I'm not about to say, on the basis of a one-minute video, that Dial should be fired immediately. If any teacher tells you that they've never said anything to a student that they later regretted, they're either lying, deluded, or a living saint. Teaching is hard, frustrating work -- especially if you actually give a damn about your students. You have to make all sorts of snap decisions, and it's impossible to get them all perfectly right. And teachers are human beings who have personal worries and woes. You try to leave them at the door of the school, but you're only human, so sometimes something regrettable happens. That doesn't excuse it -- but it also doesn't make sense to me to immediately force out a good teacher who may have just had a really bad day. Of course, if the Times had put out multiple videos of Dial yelling at students like this, I'd be saying something else. And the fact that the teaching assistant was concerned enough about Dial's behavior that she recorded this also bothers me. So I don't think we know enough about all this other than to say this was a really bad moment and a great example of what not to do in the classroom. Let's see how it all plays out. This is not the first time we've heard about problems with classroom management and discipline at Success Academies. And yet Eva Moskowitz has been held up by many on the reformy side as an educational genius, and she's been very happy to play along. Is Success Academy really the model we want for the education of urban children of color, many living in economic disadvantage? "Got to go" lists? High suspension rates? Teachers who rip up their students' work (according to one teacher in the Times story, it happens regularly at SA)? Test score fetishism? Churning faculty, many of whom are young, white, and not adequately trained? Chanting in the classrooms and marching in the halls? As Leo Casey points out, Moskowitz is bucking a national trend away from harsh discipline practices that are clearly racial biased. Is it any wonder, then, that one of her star teachers ripped up a first grade child's work in her face? Isn't this behavior exactly aligned with Moskowitz's philosophy? Why are we the slightest bit surprised that a teacher is harsh with her students in a school whose leader embraces a "no excuses" pedagogy? I've said it time and again, and I'll keep on saying it: urban "choice" is not the same as suburban choice. 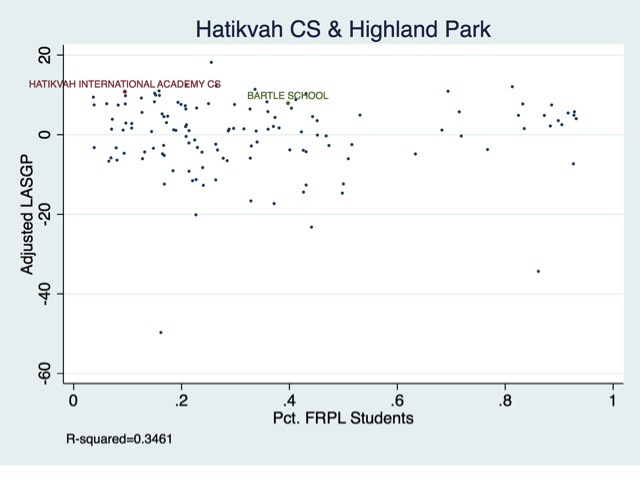 Success Academies' practices would never be tolerated in Chatham's or Scarsdale's or Winnetka's pubic schools. If you told parents there the only way to get their child into a safe, clean, well-appointed school was to give up their democratic local control of the school board and accept a "no excuses" discipline plan, you'd have a riot (probably one with lots of tasty hors d'oeuvres). Why, then, is it OK to force this "choice" on to parents of color living in cities? Today we learned that Marylin Zuniga -- the Orange, NJ third grade teacher who was fired for having her students write get-well letters to Mumia Abu-Jamal -- will have her day in court. I wrote about Zuniga previously, but the best piece you'll read about her plight is from (who else?) Jose Vilson. Jose and I have different takes on the appropriateness of the assignment; what we don't disagree on is that Zuniga got a raw deal, and her punishment was way out of proportion to whatever transgression she committed (if, indeed, she transgressed at all). Zuniga was cynically used by a group of outsiders to score political points; the support she got from so many Orange parents is proof enough of that. While a young teacher of color who gave an admittedly controversial assignment had to be fired immediately? Especially given that she didn't have tenure and her contract could have simply not been renewed at the end of the year? When it comes to students of color, it seems that our priorities are very, very warped. I'm shocked! Shocked to find a teacher yelling at a student in a "no excuses" school! On Friday, after the New York Times published a video showing a Success Academy teacher lashing out at a first grader, Success CEO Eva Moskowitz again sought to portray the behavior as an isolated incident. But she also mounted a forceful defense of the network’s teachers and its methods, while criticizing the Times’ reporting as biased. I guess "no excuses" only applies to the kids, huh? “She has helped hundreds of children thrive and be successful,” Moskowitz said, flanked by more than 150 Success teachers, administrators, and parents. Well, look -- it was shot on a phone (wasn't it? ), so it's not like it's a surprise the assistant had a camera with her. Still, it is awfully hard to think this happened only once; of course, having proof of that is another matter. As to never having a bad day: I agree it should never happen -- but it does happen. Getting teachers help first, however, seems to me to be a more appropriate response than mandatory firing. It is well within the realm of possibility that a teacher can get past a bad incident and still be productive. Of course, some things ought to get you fired immediately. This one comes right up to the line for me... your mileage may vary. But that doesn't address the larger question: was Dial's behavior really that out of line with Success's practices? If not, then we're looking at a systemic problem, and not solely an individual one. In a way, by treating Dial's actions as an outlier, Moskowitz is throwing her under a bus. She's refusing to take responsibility for what happened, just like the "got-to-go" list. She's refusing to look at her own possible culpability in the matter. Doesn't she feel any obligation to do so? Or is protecting the Success brand ultimately more important to her? Natasha Shannon, the parent of three students in Success schools who attended, said she believes in Success’ mission, including the disciplinary policies. No, they just have to send their child to an underfunded, crumbling, large class-sized, segregated public school. If SA works for Ms. Shannon, I'm happy for her. I've never criticized a parent for sending their child to a school like SA, and I never will. But her menu of "choices" would never be tolerated in a white, suburban public school district. Isn't this a serious problem? I'm going to put the charts and graphs and scatterplots and citations away for a minute so we can cut right to the heart of the matter. - Charter schools are "beating the odds." - Teacher quality is the number one "in-school" factor affecting student success. But teacher education programs are not working and should be replaced with "real" teacher training, like TFA and Relay Graduate School. - "Choice" is bringing equity to urban schools. So is testing. If you question the proliferation either -- even for your own children -- you're pretty much a classist and/or racist. - Poverty is not destiny; "miracle" schools are proving poverty's effects can be overcome. If you follow the arguments of the "reform" movement, you'll know what I'm saying is not a parody -- these people really do believe this stuff. They really do think schools, by themselves, can overcome massive economic inequality, generations of racism, and a social system whose primary task is to replicate itself. They really do think that simply changing the governance structure of a school away from democratic local control to market-based private control will somehow unleash education excellence. They really do think the quality of teachers is uniformly mediocre, but that it can be improved without spending any additional monies simply by changing incentive structures. They really do think fast turnaround prep programs are perfectly adequate for training people in the incredibly complex art and science of classroom teaching. They really do think test-prep pedagogy is adequate for gaining the social and cultural capital necessary for social mobility. They really do think everyone should go to college, and that over-credentialing the millions of people who do necessary work will somehow ameliorate socio-economic inequity. It's amazing to me that we are arguing about things that, to my mind, defy all common sense. 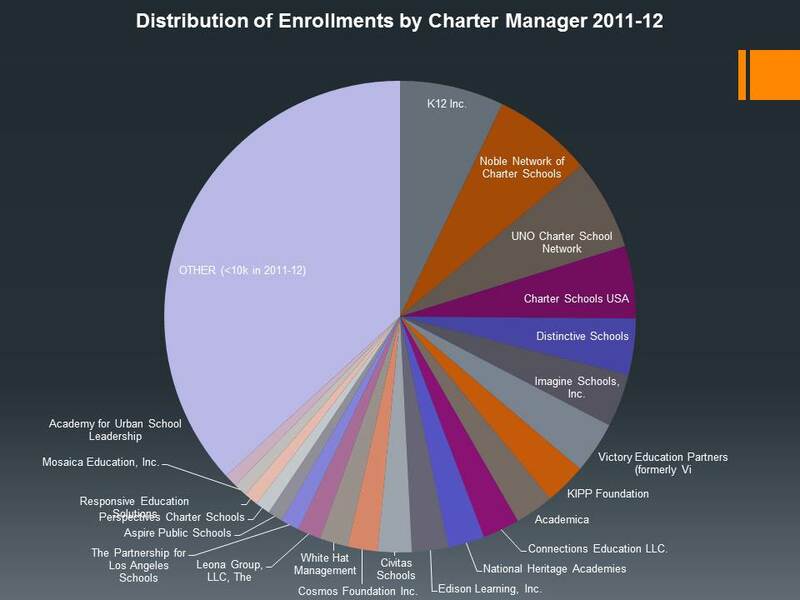 You really think charter proliferation is going to change the social structure of this country? You really think teacher quality is uniformly poor given how much we're willing to pay teachers? 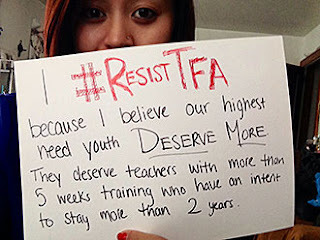 You really think university-based ed schools are prepping teachers worse than TFA? 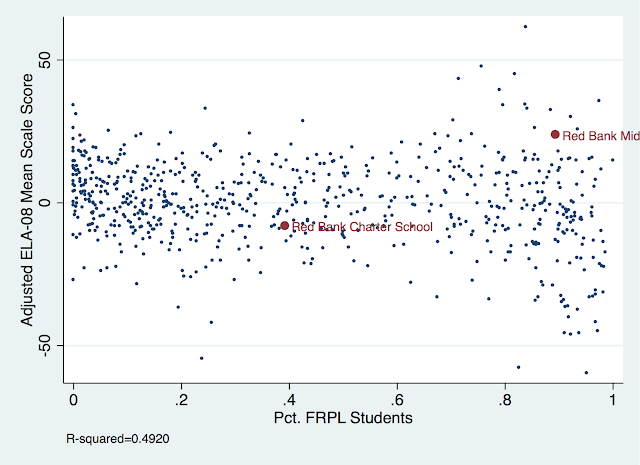 You really think you can replicate the tiny number of charters who "beat the odds" -- and that their test score gains are indicative of the success of a "No Excuses" pedagogy in preparing students for elite colleges? And you really think this is, all together, the "civil rights issue of our time"? Seriously? Some of the reformsters are clearly nothing more than hacks. But I genuinely do believe the majority are sincere. I think the vast majority of college kids who sign up for TFA are committed to making this country a better place. I think the vast majority of charter school teachers are committed professionals who are proud of their work, and should be. I think the parents and students who enroll in charters are absolutely correct in their disdain for our under-funded, crumbling, at times dangerous urban public schools. I think "reform" advocates who point out that suburban schools are highly segregated are spot on, and all children have a right to attend a school that is safe, clean, and well-ordered. As I've said many times, no one should ever blame a parent for enrolling their child in a charter school when the alternative is far worse. I think teacher prep in universities and colleges could be improved. I do think there are teachers who gain tenure and then backslide; they should be made to improve or be removed. I do think teachers are important; I wouldn't be one if I didn't. I know that adequate funds are a necessary precondition for school success, but that schools should be held to account for efficient spending. Reforminess is the status quo. But because reforminess has come to dominate our media and our policy initiatives, its tenets deserve to be analyzed and critiqued. I invite everyone to judge for themselves the merit of the arguments for and against "reform"; I am quite confident that if you keep an open mind, you'll come to the same conclusions I and the good folks who are listed at the left side of this blog have. Teach for America, the program that places newly minted college graduates in some of the nation’s most difficult classrooms for two-year teaching stints, is holding a summit this weekend in Washington to mark its 25th anniversary. The list of speakers reads like a who’s who of activists and leaders behind recent changes in education policy around the country, from former D.C. Schools chancellor Michelle Rhee to Eva Moskowitz, the head of the largest chain of charter schools in New York City. The singer Janelle Monáe will entertain at a glittery gathering of an estimated 15,000 Teach For America alumni; the organization’s many donors will also be on hand. And roaming among them is Gary Rubinstein, a nationally known scold of TFA. Rubinstein, a former TFA volunteer who is in his 14th year of teaching math at Stuyvesant High School in New York City, says he wants to force an “honest discussion” about TFA — including its weaknesses. To that end, he created a Twitter account @TFA25FactCheck and a new blog and will attend the summit, looking for opportunities to inject what he calls “reality” into discussions about the best ways to improve public education. He is helping to organize a happy hour for those who share his concerns about TFA and said he will also hold an impromptu discussion during the three-day event, after he said his requests to join official panels were spurned by TFA organizers. 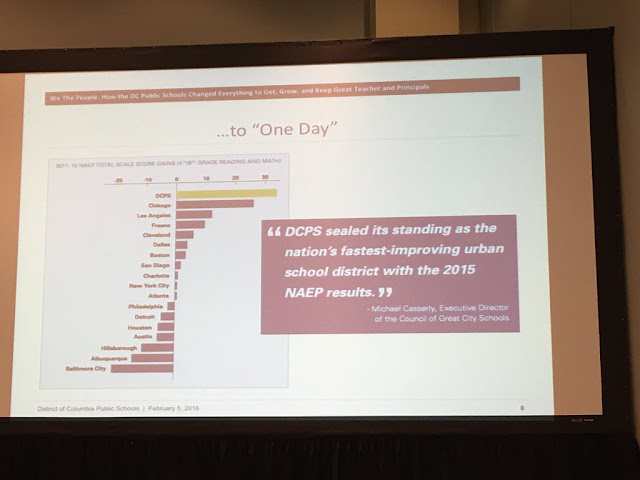 Apparently, this slide was shown as "proof" that the reformy reforms in Washington D.C. -- including innumerate teacher evaluation -- are leading to gains so large in the nation's capitol that they must be rendered in bright yellow bars. - Test score gains are not necessarily equivalent across different tests. In other words: we don't know if gaining 10 points on the Grade 4 reading test is at all equivalent to gaining 10 points on the Grade 8 math test. - Test score gains are not necessarily equivalent across different parts of a score distribution. In other words, going from a 230 to a 240 is not equivalent to going from a 260 to a 270: it might be much harder to gain 10 points from one starting point than it is from another. So combining the scale scores of different tests at different starting points and then comparing them is pretty much worthless. - It is pointless to compare test score gains without accounting for changes in student populations. We know D.C. has seen substantial demographic changes; you can't just slap up scores that correlate to student characteristics without acknowledging these changes. - Test score changes are not, by themselves, proof that particular policies are successful. Look at the top of this slide: "How the DC Public Schools Changed Everything to Get, Grow, and Keep Great Teachers and Principals." Is the person who put this up seriously suggesting a few teacher policy choices are the cause of the test score gains? That it couldn't possibly be a host of other factors? Really? OK, I wasn't there. Maybe this was a simple descriptive introduction, leading up to a sophisticated analysis with proper controls for student population changes and scale differences. 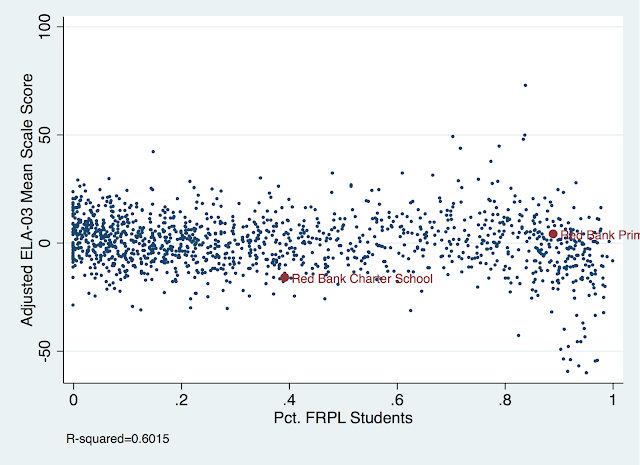 Maybe this was used as an example of how not to use NAEP data to make a case for a particular policy intervention. Maybe TFA is going to have a weekend full of serious policy discussions, and not engage in some really shameless data manipulation to push their particular agenda. This year, I'm doing an occasional series about the many unknown charter schools that aren't affiliated with the big, non-profit charter management organizations like KIPP or Uncommon or Success Academies. 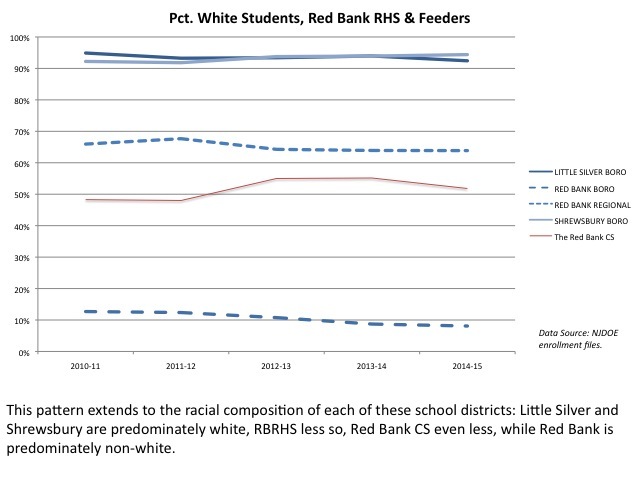 Last time, I showed how a small charter in Red Bank, NJ, was likely impeding any chance of the community being able to integrate their schools. Let's stay in the Jersey 'burbs and discuss another small charter, and how it's affecting the local public district schools. 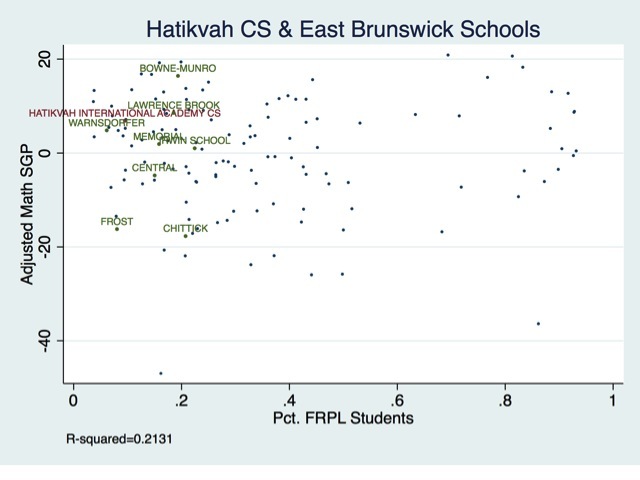 About half of Hatikvah's students are in East Brunswick, where the school is located. But small numbers of students -- in some cases, a single student -- are coming from districts within a wide area. 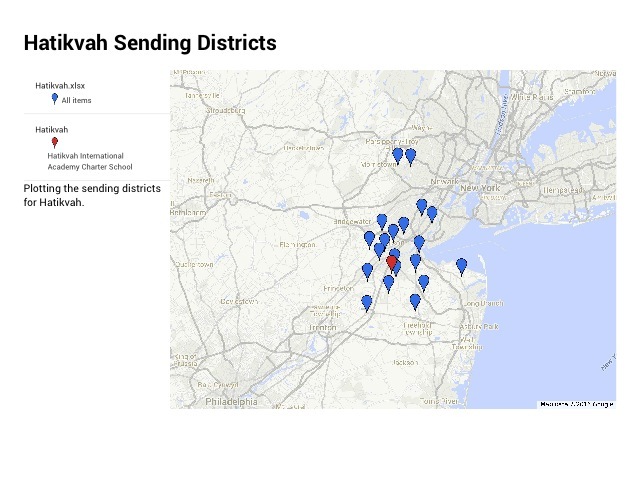 Florham Park, the northernmost district, is sending one student. What's going on here? The answer is to be found in Hatikvah's unique curriculum: it's a Hebrew immersion school. 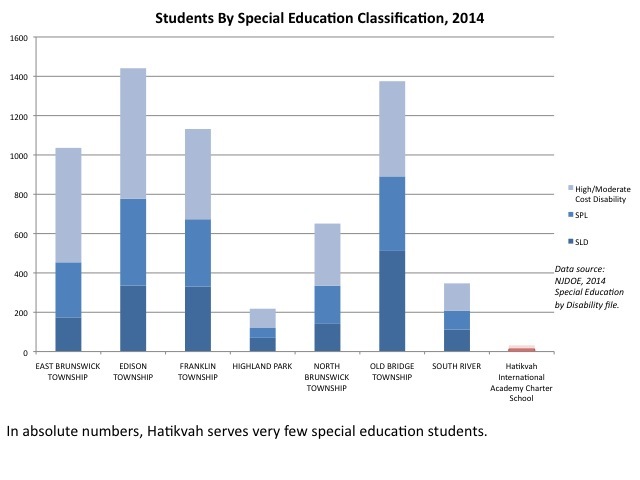 Apparently, the NJDOE thinks it's so important for a publicly funded school to teach Hebrew that it's willing to allow students from a wide area to enroll in Hatikvah, dragging their share of taxpayer revenue with them. 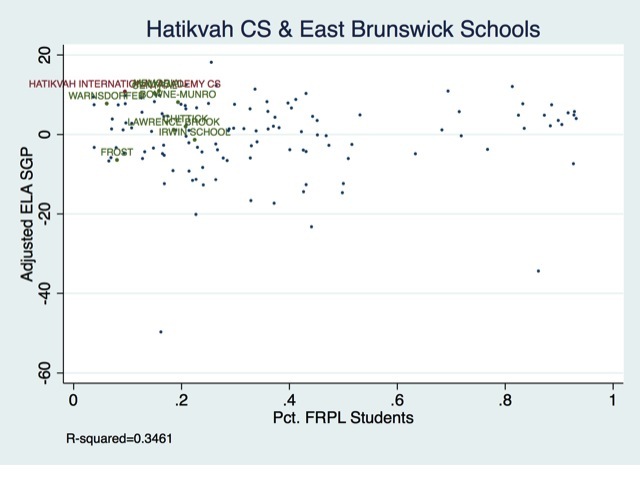 We have looked at all of the HCSC's available Form 990s, and what we found is that from 2010-2013 the HCSC has given over $1 million dollars to Hatikvah, and over $500,000 to create a religious after school program that ONLY serves students from Hatikvah. The stated goal of the program, called Nefesh Yehudi Academy, is "to provide a Jewish education to complement the curriculum of a Hebrew immersion charter school program, while encouraging students to appreciate the diversity of all Jews." This is not surprising, since the mission of the Steinhardt Foundation for Jewish Life is "to revitalize Jewish identity through educational and cultural initiatives that reach out to all Jews, with an emphasis on those who are on the margins of Jewish life, as well as to advocate for and support Hebrew and Jewish literacy among the general population." 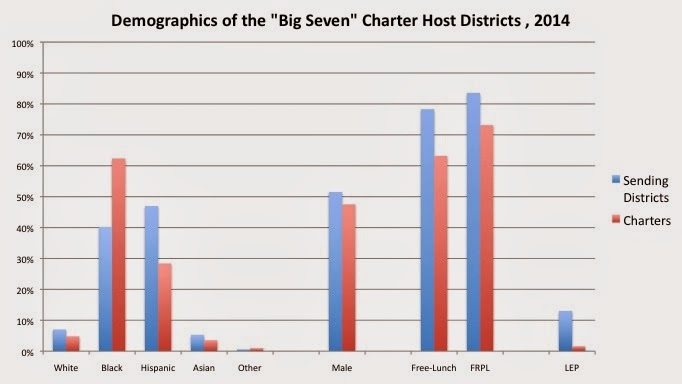 While Mr. Steinhardt is welcome to use his vast fortunate to "revitalize Jewish identity," his efforts to do so using public tax dollars to create secular charter schools supplemented by religious after school programs, both created and supported with HCSC funds, is a misuse of the tax dollars that flow into the public charters. 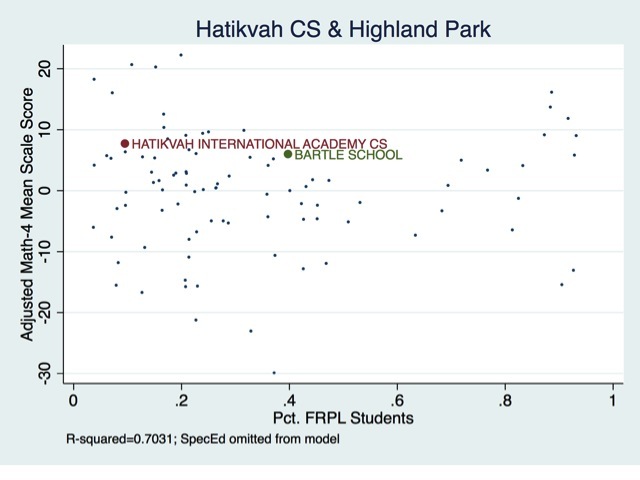 Steinhardt has essentially created a low cost alternative to a religious education (Hatikvah is free, and Nefesh Yehudi Academy is $2,800 as per their registration form). 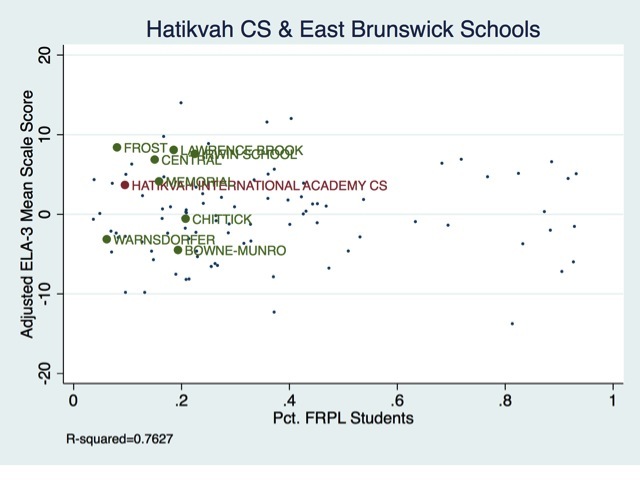 As in the past, Hatikvah posits that increasing enrollment would not harm East Brunswick. They suggest that only approximately 9 students of the proposed expansion of 200 students would come from East Brunswick and this would only cost the district in year one an additional $100,000 or so. 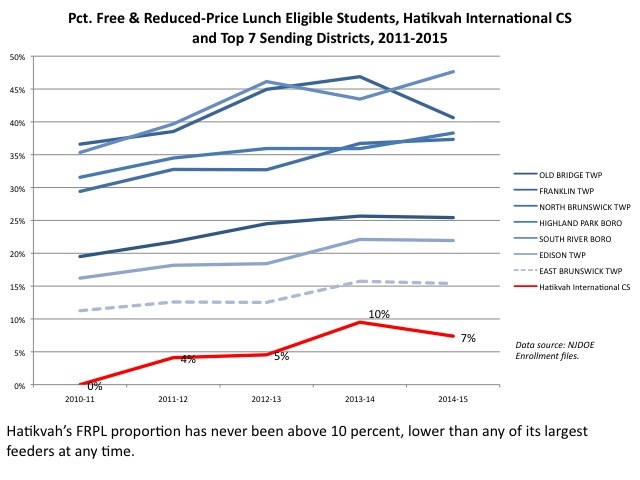 (Think what it would cost the other districts that have no say in Hatikvah’s expansion into their districts.) Even another $100,000 next year would harm East Brunswick. 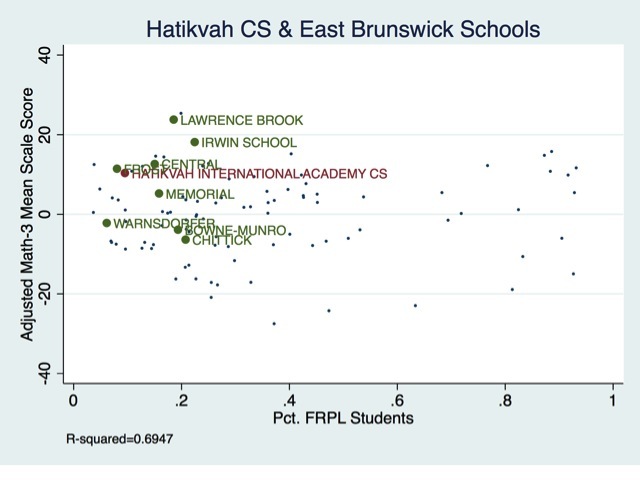 The East Brunswick Public Schools already spend a sum equal to 98% of the State imposed cap to support Hatikvah. Another $100,000 would make it more than 100% of the cap! The cost would increase each year as students move up through the grades. Long time readers know one of my best blogging (and real-life) buddies is the intrepid Darcie Cimarusti, aka Mother Crusader. Darcie has been fighting for a good long time to bring sanity to the New Jersey education system, starting with her hometown of Highland Park. Her activism led her to run for the school board and win a seat; this past year, she was elected board president. My board would like to inform you that Hatikvah has essentially morphed into a statewide charter school, pulling students from 28 districts in 7 counties to fill their seats. 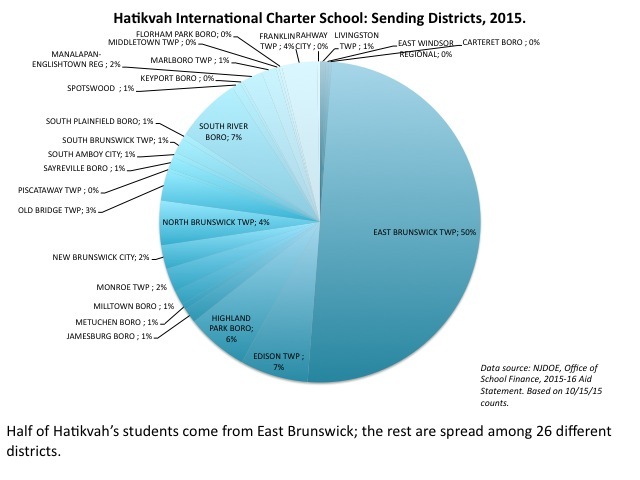 Hatikvah was approved to serve East Brunswick, and East Brunswick alone. In fact, in their 2009 application to the state they stated that they didn’t anticipate any out of district enrollment. Now five years into their charter, 50% of their enrollment comes from districts other than East Brunswick, demonstrating a clear lack of interest in their district of residence. There are no provisions in the state’s charter school law that allow a statewide charter to even exist. This Department has written no regulations, and this Board has approved no regulations to oversee the operation of a statewide charter. 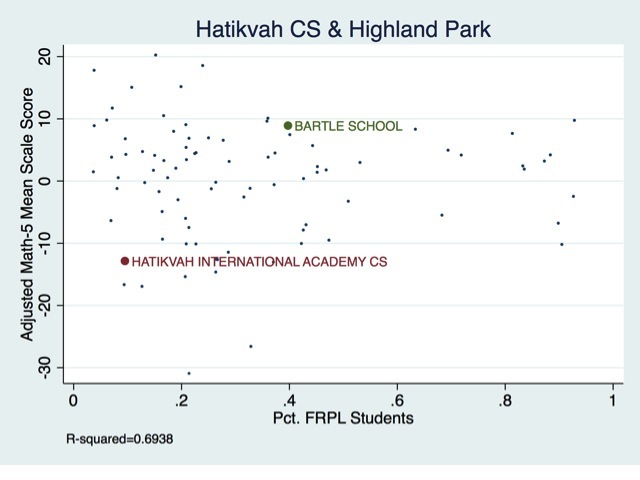 If Hatikvah were restricted to accepting students only from their district of residence, not only would they be unable to expand, they would be forced to close. Even if they were restricted to their district of residence and a handful of contiguous districts they would be unable to exist. In order to keep their doors open they continue to draw more students from more districts, and as each year passes, more funds are lost. When Hatikvah opened in 2010 we lost $61,847. This year Highland Park lost $318,201. In 5 years time, Highland Park’s costs have increased fivefold. 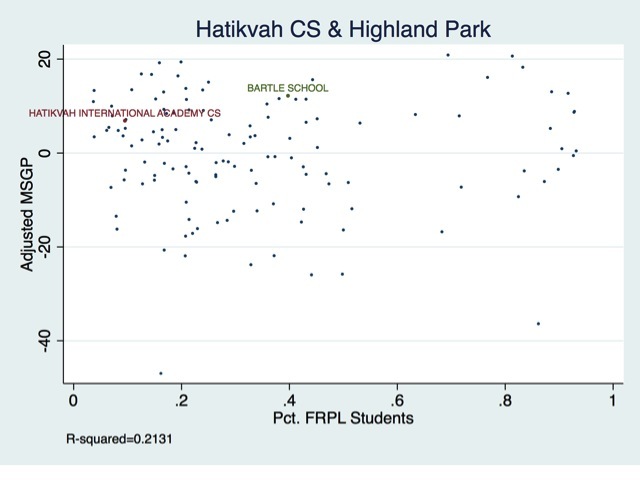 But Highland Park is not part of Hatikvah’s district of residence, so Hatikvah is not required by law to notify our district of their plans for expansion, and our district is not given an opportunity to respond to the proposed expansion. We are essentially left in the dark and rendered voiceless. And that is the insanity of NJ charter school law: because the state is the authorizer, a charter does not need local approval before it can enroll students and cause harm to a district's programs. A district, therefore, has to bear the fiscal burden of supporting a redundant school system simply to support a boutique curriculum that the vast majority of families in the town do not want. How does this make any sense? Is it really so important that a few families, scattered over a wide region, get a publicly funded school to teach their children Hebrew? Is the benefit from this so great that it's worth negatively impacting the finances of local, district public schools? And, perhaps more importantly: why should local towns have to support charter schools that increase economic and racial segregation? 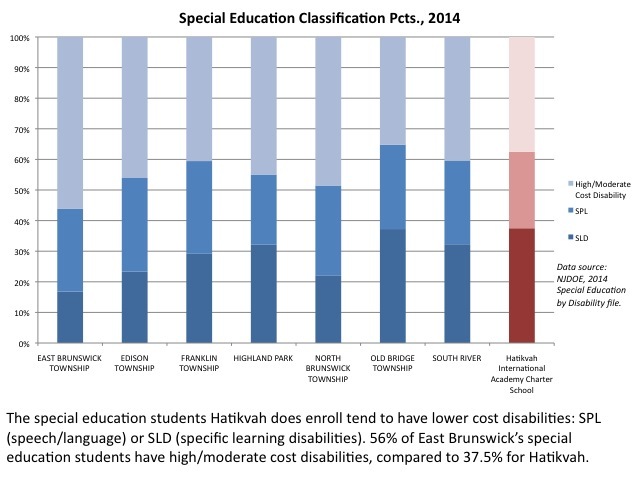 In addition: the very few special education students Hatikvah does enroll tend to have lower-cost needs compared to East Brunswick. Again, this is quite typical for a New Jersey charter school. And it matters not just in terms of cost: it matters for accountability measures. 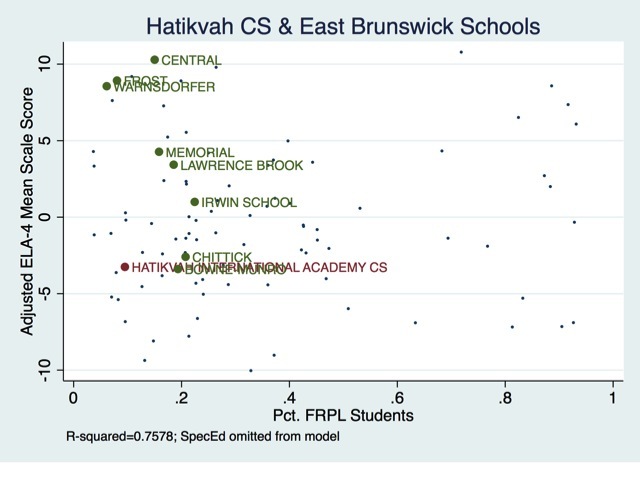 The East Bruswick schools are in green: they all "beat prediction," meaning they all scored better than we would predict based on their free and reduced-price lunch (FRPL) and special education proportions. Hatikvah scored under prediction. 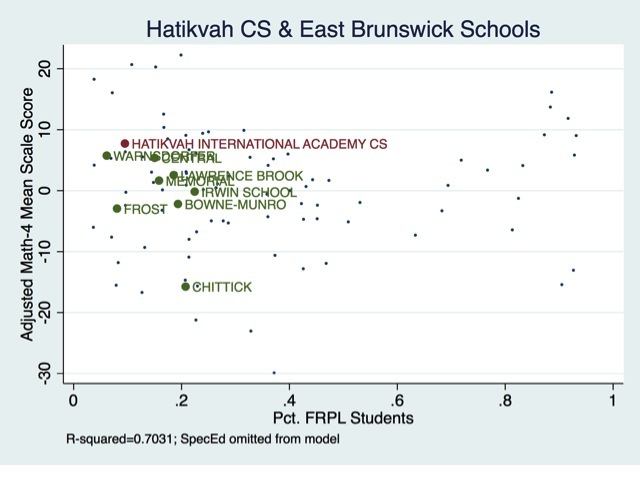 Can anyone credibly make a claim that Hatikvah is a badly needed alternative to East Brunswick's public district schools? 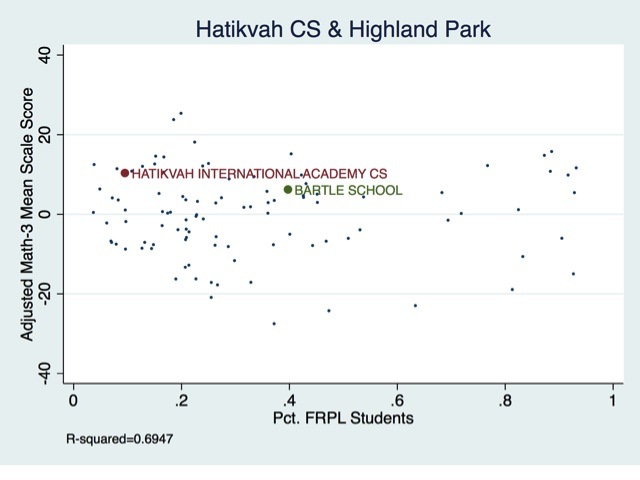 Highland Park has more than twice the students, proportionally, who are FRPL than Hatikvah. Yet they outstrip the charter on adjusted Grade 5 ELA and math scores -- handily. Again, there's variation by grade... but where is any proof these districts' students need a charter for a "better" educational option than their already fine public district schools? Folks, if you want your kids to go to a school where they learn Hebrew, then by all means, sign them up at a private school. Or send them for religious instruction after school -- it's your right, of course. But the idea that our schools should be able to cater to every parent's desire, every educational whim, is absurd. The taxpayers should not be made to support redundant and inefficient systems of schools simply to fulfill the specialized wishes of a scant few families. It took former Education Commissioner Chris Cerf a while to figure it out, but he eventually came to the realization that putting a bunch of boutique charters in the 'burbs was a really bad idea -- educationally, fiscally, and politically. After all, Chris Christie's (quickly eroding) political base was in the suburbs: why would they want to see their public schools, which enhance the value of their homes, damaged just so a few students could enroll in a Hebrew immersion school fueled by their tax dollars? Unfortunately, a few of these charters out in the leafy 'burbs got approved; now, some are having trouble enrolling enough students from their own towns to justify their existence. I don't doubt that if I started a charter based on a clown college curriculum, I could probably find enough students across a wide area who would sign up. That doesn't mean allowing these schools to expand their reach is good public policy -- partially if they increase racial and economic segregation while damaging the public district schools' bottom lines. 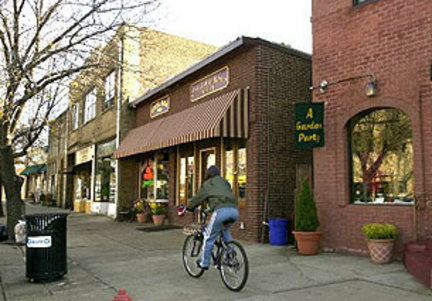 Highland Park: One of the nicest small towns you'll ever visit. ADDING: Here are some other adjusted scores. 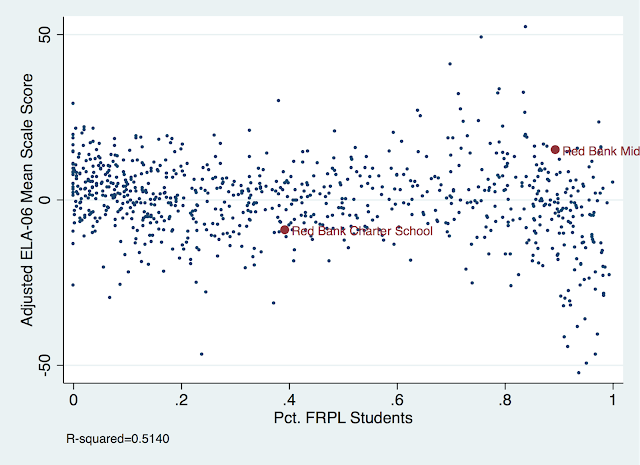 The regression model uses NJASK scale scores for the dependent variable, and school-level FRPL percentage or special education percentage (all courtesy of the NJDOE) for the independent variables. Residuals are expressed as scale score differences and are not standardized. For the Grade 4 models, special education percentage wasn't a statistically significant factor, so I removed it (yeah, we could argue about that, I know, but I ultimately decided it was more fair to do so if I couldn't get p < 0.05). I plotted the residuals on the y-axis against FRPL percentage on the x-axis just to give a little more description to the data. Here are adjusted SGP or "growth" scores. 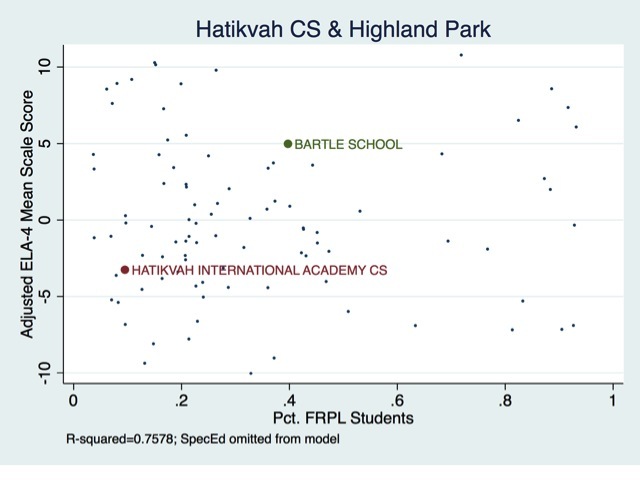 It's a weaker model because SGPs account somewhat more for student characteristics, but again: there's no consistent pattern of Hatikvah outscoring its host districts. 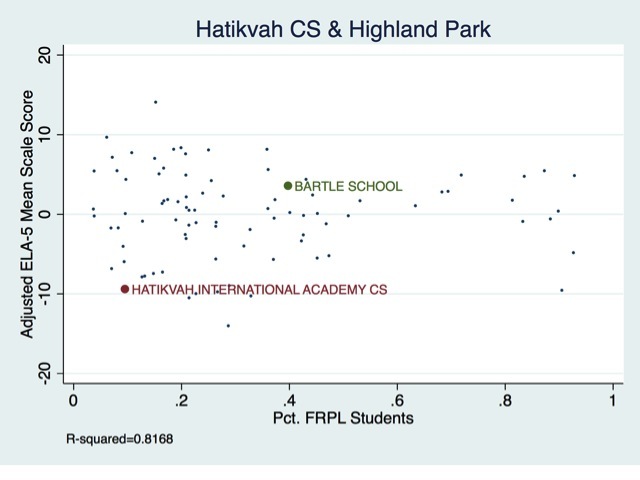 Again: where's the evidence Hatikvah is really needed in either town?